This is only a general perspective guide for the twelve earthly branches of the Chinese almanac for July 2011. In this, I have attempted to point out the factors that may affect you beneficially this month and also those of which you should beware of according to your animal sign. The effect on individuals should be considered within the context of the monthly Flying Stars. Please do not think that because, for example, you are a Monkey and you read below that July 2011 will not be good, you will therefore have a bad month. No, a positive attitude and hard work combined with knowledge of what the month ahead has in store for you will enable you to avoid many problems and disappointments. Be very careful on the 12-17-24 & 29 July as these are either, year, month or sha days and not good at all, so please do not plan any important tasks for these days. If you would like to be better informed of good and bad days check our free monthly almanac or our powerful date selection Tong Shu almanac software. This is a month full of activity and movement which can be to your benefit if you are motivated. You have probably found the past few months a bit rocky but this month should be better. Pursuing breakthroughs and taking risks are not in your nature so you may find this month’s rhythm a little tiring and hard work. However, do keep an open mind and maintain an optimistic attitude. You may meet new friends and acquaintances who can prove beneficial to you but beware of gossip and bickering. Make sure that young Rat take sufficient rest or their health will be put at risk when over-extended by the influences of the month, especially when it comes to respiration problems. When dealing with people try and keep your emotions cool as your hot head can get you into deep trouble, so a diplomatic approach is needed this month and really throughout the year. Wear a hematite or Tiger eye power bead to keep you focused and an amethyst one for keeping you in good health. For your protection, you should have a key chain pendant of an Oxwith you at all times. You can also place a little statue of an Ox on your work desk for support. If you want to enhance or attract new relationships place a pair of mandarin ducks in the centre part of your bedroom this month. The inauspicious argumentative #3 star enters the central palace this month combined with the auspicious annual #7 star; it can bring arguments, bickering and/or legal problems into a home or business. Place a red object in the centre of your home or business or carefully burn a candle each day or place a bright light, please be careful if using candles. Be careful not to place a fan on warmer days and nights in the centre of a room or centre of your building, I guarantee if you do it will cause you many problems. If your bedroom, lounge, office or any other important room is located in the centreplease be careful signing important papers as there could be treachery in July, ensure you read all the small print. You can also suffer from someone trying to back stab you or steal from you, so place something that is red in colour in the centre such as a rug, door mat, sofa throw etc; this will help calm this negative influence. A traditional cure is a red statue of a Kwan Yin. Be very careful this month if your main door, bedroom, lounge or office or any important room is located in the west or southeast. If your main door or important room is located in the west or southeast make sure you place a Wu Lou and/or a set of six Chinese coins tied in a row with red ribbon especially if you are not in good health or feel very stressed. If your bedroom, office or main door is located in the southeast please make sure you do NOTintroduce any candles here or colours red, pink, purple, orange or any other fire colour. If you have an important room in the west use some blue, grey or black objects like bed covering, floor covering or cushion covers. Please avoid the west this month, it really is not good at all and place a wu lou beside your bed if your bedroom is located in the west. The negative aspects of the visiting monthly #5 yellow may bring obstacles at home or in business, it can also cause problems with joints, bad luck or just a very slow energy. If your main door is located in the west place a ba gua mirror and a wu lou. Those of you with bedrooms, lounge, office or any other important room in the west and southwest must make sure you drink plenty of water and be very careful of what you eat, the combination in July can cause problems with the stomach and bowel so if you are holidaying please be very careful. I will be taking care regardless of my office direction as this month I am working abroad in some pretty hot countries in July. Good sectors for the month of July are the north, east and northwest and if your door, office, bedroom or any other important room is located in these areas your month will be good. Take a look at the annual cures and enhancers on how you can enhance your month and year even further. To activate relationships in July you can place something dark blue or black in colour in the northwest of your home. A quick and easy way of introducing the colour is placing a sofa throw, bed cover, rug, table cloth; it is actually very easy if you think about it. If you use symbolic items in relations you can place a pair of Mandarin ducks or double hearts in the NW. With regards to wealth you should spend more time in the north of your home or office and enhance the north by placing a faceted crystal sphere and/or a real piece of quartz crystal. I do not recommend heavy work or renovations in the north though. Be very careful on the 5-9-17-21 & 29 July as these are either year, month or sha days and not good at all, so please do not plan any important tasks for these days. If you would like to be better informed of good and bad days check our free monthly almanac or our powerful date selection Tong Shu almanac software. To further enhance your month check out the July monthly almanacas it not only gives you good and bad days to do certain tasks it also tells you if it is good for your animal sign. 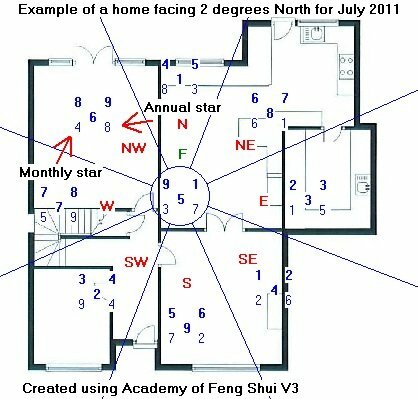 Take a look at your 2011 annual animal predictions and also the 2011-flying star (Xuan Kong)as you will need to follow the advice carefully to ensure a trouble free year in 2011. You can place your annual cures and enhancers at any time of the year after February 4th 2011. July should be a month full of action and progress although there may be a few ups and downs but they can actually be to your benefit if you are enthused. Pursuing breakthroughs and taking risks are not in your nature so you may find this month’s tempo a little tiring and hard work. However, do keep an open mind and maintain an optimistic attitude. You may meet new friends and associates who can prove beneficial to you but beware of gossip and bickering especially if your home faces northeast or southwest. Make sure that young Ox take sufficient rest or their health will be put at risk when over-extended by the influences of the month, especially when it comes to respiration problems. When dealing with people try and keep your emotions cool as your hot head can get you into deep trouble, so a diplomatic approach is needed this month and really throughout the year. Wear a hematite or Tiger eye power bead to keep you focused and an amethyst one for keeping you in good health. For your protection, you should have a key chain pendant of a Ratwith you at all times. Your lucky sector is the North-Northeast (22.5º – 37.5º) of the home or office. If you want to enhance or attract new relationships place a pair of mandarin ducks in the northeast part of your bedroom this month. The inauspicious argumentative #3 star enters the central palace this month combined with the auspicious annual #7 star; it can bring arguments, bickering and/or legal problems into a home or business. Place a red object in the centre of your home or business or carefully burn a candle each day or place a bright light, please be careful if using candles in your home or office with regards. Be careful not to place a fan on warmer days and nights in the centre of a room or centre of your building, I guarantee it will only cause you problems if you do. If your bedroom, lounge, office or any other important room is located in the centreplease be careful when signing important papers as there could be treachery in July, always make sure that you read all the small print. You can also suffer from someone trying to back stab you or steal from you in July this year, so place something that is red in colour in the centre such as a rug, door mat, sofa throw etc; this will help calm this negative influence. A traditional cure is a red statue of a Kwan Yin. Please be very careful on the 5-9-17-21 & 29 July as these are either year, month or sha days and not good at all, so please do not plan any important tasks for these days. If you would like to be better informed of good and bad days check our free monthly almanac or our powerful date selection Tong Shu almanac software. July is a month to keep a real close eye on your health and mind, so please try and take time out to rest especially if you are an older Tiger as there is a risk to your heart, this is so important this month. It is not all bad though as you may receive some unexpected good news. Avoid burning yourself out in July as a lack of motivation can be a problem so please take care. you may find that you receive help from people that you did not expect it from this month, so be prepared to accept help from those that offer it. Wear a hematite or Tiger eye power bead to keep you focused and an amethyst one for keeping you in good health. For your protection, you should have a key chain pendant of a pigwith you at all times. You can look forward to an auspicious month in July. Your guardian stars are shining protectively over you dispersing many of the difficulties or mishaps you may have encountered the last months. Although the month of August will be very good for you, you should be very careful signing documents, make sure you read them over and over and then get someone else to check them again especially if you have an important room in the northeast like an office, bedroom or study. Work and home life will be be very calm and settled this month if you are prepared to take it easy and not jump in to anything too big for you to handle. It may work to your advantage to accept the support of people around you. There is a risk of conflict arising around your home life this month but, if these are dealt with in a calm and coolheaded way, they can be resolved. You must be very careful signing contracts this month, read the documents carefully and then give them to as many people as you can to double check them. On the home front, misunderstandings are indicated so do be patient and if faced with an argument be prepared to give way. If not, small arguments may become big ones. Overall it will be a very good month and expect some nice surprises. Remember if you are patient in one moment of anger, you will avoid one hundred days of sorrow. Your lucky sector is the East-Southeast (112.5º – 127.5º) of the home or office. Place a cluster of clear crystals or gemstones in the south sector of your room to enhance wealth in June. You may find that plans and goals may not develop as planned or plans get changed suddenly without prior notice or indication which may become very annoying for you in July. Don’t get too upset if the changes are only a matter of schedules. Just remember to stay focused and flexible at the same time. Be sensitive with friends and family and do not turn your frustrations into problems with harsh words which will certainly bring regrets. You must spend quality time with your loved ones and this means girl/boyfriends, mum/dad brother sister etc, you must listen to what they say as this month can cause many problems with relationships and you will appear to give off an energy of not caring so please take note and arrange some special events for loved ones. On the other hand the month could bring in a few nice surprises. You can expect a nice turn of events in July, particularly if you are a single Horse. This may take the form in the shape of a possible promotion, salary boost or promising new business opportunity. A good month for the Horse with satisfying results both in work and relationships. Try to keep your spirits high as much as possible this month and this will help you to solve problems easily and with confidence. I would reccomend taking the time to arrange outings or holidays with family in July as this may help improve the health and quality of family life. Events will flow smoothly for the Goat as long as you keep a low profile. If you do not, the elements will work against you which may well result in you suffering setbacks and difficulties in your endeavours both at work and in relationships. When dealing with people try and keep your emotions cool as your hot head can get you into deep trouble, so a diplomatic approach is needed this month and really throughout the year. Wear a hematite or Tiger eye power bead to keep you focused and an amethyst one for keeping you in good health. Be very careful when signing contracts this month and ensure you double check all documents and alos check the flying star information below for February. For protection you should have a key chain pendant of a Horsewith you at all times. You can also place a little figurine of a Dragon on your work desk for additional support. Take a look at your 2011 annual animal predictions and also the 2011-flying star (Xuan Kong)as you will need to follow the advice carefully to ensure a trouble free year in 201. You can place your annual cures and enhancers at any time of the year after February 4th 2011. During the month of July, there is a strong probability that you will encounter difficult times and so do not be reckless in your actions. This will seem strange for the Horse, do not worry though just be cautious this month and take no risks. Be careful not to get involved in arguments at home or work as they will not go in your favour. This also applies to any potential legal problems, make sure you deal with them and do not postpone dealing with them as they will grow. For protection you should have a key chain pendant of a Snake with you at all times. This is a month to pay special attention to your health so please try and take time out to rest especially if you are an older Rooster. This is so important in July. It is not all bad though as you could receive some unexpected good news. This month in particular it is important to have protection and having a symbol of a Dragon close to you is vital to help ease any problems. Wear a hematite or Tiger eye power bead. Work is successful with good investments for the Dog in July and success may become present in your enterprises. If possible, be generous and charitabl,. whether it is at work or at home. This should be a nice month with unexpected good news for career and relationships. To further enhance your month check out the monthly almanac as it not only gives you good and bad days to do certain tasks it also tells you if it is good for your animal sign. July is a very good month on the whole with many sun stars shining on you. If you work hard and apply yourself correctly, you will find the month will work in your favour very much. You will find yourself working harder in July and you must take time to recharge yourself so you do not burn out. Try and make allowances for this now as July should also be a good month with hard work, so you will need to schedule some time out for you and also your partner as you can neglect them in your busy and successful phase. For protection you should have a key chain pendant of a Tigeron you at all times. You can also place a little figurine of a Tiger on your work desk for additional support. I hope you have enjoyed reading this information. As I said at the beginning, if the prediction for your earthly branch (animal) is not so good this month, you can avoid any potential problems by following our advice above and also by being aware of the monthly flying stars. Good luck and have a wonderful July. To further ensure a smooth month ahead and for more information on the monthly Almanac and choosing auspicious days follow this link.